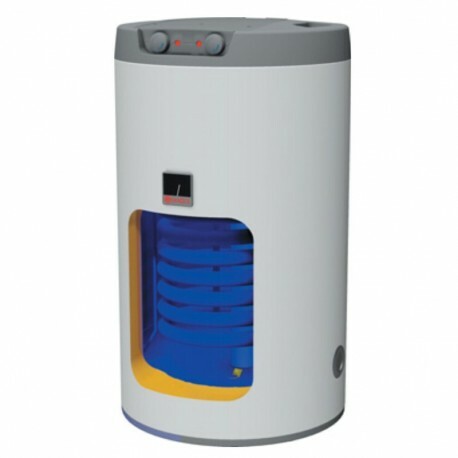 The water heater Dražice OKCE 125 NTR / 2,2 kW are suitable for installation with various energy sources (e.g. condenser gas boiler, solid fuel boiler). The models usually include the exchanger surface, they can transfer higher boiler output and the heating period becomes shorter. It can be connected to electricity network. Thanks to their construction and number of variants, the OKCE 125 NTR series storage tanks enable economic preparation of hot service water (HSW) by means of various power sources. Their nominal performance provides sufficient amount of hot water for flat units, premises, restaurants, and similar establishments. For HSW reheat, electricity, various types of central heating boilers, recoverable energy sources (heat pumps, solar collectors) and combination of those can be chosen. Closing valves of the heat exchanger must be opened which ensures heating water flow from the hot water heating system. Together with a closing valve, it is recommended to install an air outlet valve at the inlet to the heat exchanger in order to bleed the heat exchanger as needed, in particular before the beginning of the heating season. The time of heating using the heat exchanger depends on the temperature and flow of water in the hot water heating system.